I am an opportunity kind of a pitcher/player. If you look at my stats they aren’t bad, I pitched 2 innings my Freshman year in college, got hurt my second year (had Tommy John surgery), rehab for a year and 6 months, still wasn’t fully healthy but pushed through it and got enough innings to get a 3/4 scholarship to Baker University in Kansas. 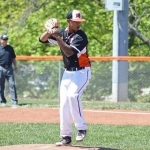 My junior year there I got Honorable mention All-Conference pitching 20.2 innings, this was my first full season in college, and become the closer the year after. As I was saying in the first paragraph I just need an opportunity to showcase what I can do, and where I belong in terms of pitching rotation. I am coachable and am 100% in on learning more as I go and picking brains along the way to learn and grow and be the best version of myself that I can be as a pitcher/player. I don’t throw 90s….not yet! but I can get outs and If I get the chance I will make the best of it! I had the pleasure to coach Kekai for 2 years at Baker University. Both years he was our best bullpen arm including being named to the all-conference 2nd team his Junior year. He does a great job of competing and mixing his pitches. Both breaking balls he throws have the ability to get swings and misses and his fastball typically has some run that allows to pitch to contact and not get squared up. He is also willing and capable of throwing multiple days in a row along with coming into games with runners on base. He definitely deserves an opportunity to continue playing and is worth giving a chance. To begin, Kekai is the type of teammate you want in your organization. He’s the type of teammate that is always there to encourage and promote positive energy throughout, but also isn’t afraid to put his foot down when it’s time to lock it in. His work ethic is one of a hard worker whether it be in the gym, on the field, or in the barbershop. When he shows up, he’s ready to work hard. As far as his abilities go- he is very athletic and has a strong build. Capable of swinging it at the plate but shows much more dominance on the mound. He has good mound presence and shows confidence with pitches. He has a 2 seam fast ball with average run in on a righty. 4 seam is over the top with slight run. Both fast balls range from 82-86 and can locate to both sides of the plate. He also has two curveballs one that is a 12-6 over the top and and another that is more slurve like. Average change up with drop and run. His best pitch is his slider to both a left and righty. Mixes 2 seam and slider together well as well as 4 seam with curveball mix because of arm slots. Arm action is relatively close from pitch-to-pitch. Kekai is capable of throwing from both the windup and stretch but mechanics look more consistent and pitch accuracy is greater out of the stretch. He is also a good at PFP’s due to his infield background. This all comes from playing with Kekai over a 3-4 year span in both jr college and university play. I was fortunate enough to coach Kekaí here for 3 years. During his time here he improved immensely. His command of all his pitches got better and his fast ball was up to 83-86 mph. His greatest strength as a pitcher was always his competitiveness. He was never afraid of any moment and always wanted the ball in his hand. His athleticism on the mound was great as well as he shut down opponents run game as well as any threats of bunting. It’s my pleasure to recommend Kekaí, he is a wonderful person.